Where are you God? Why does it sometimes feel like God is silent? Is He hiding from us? Is He angry? What are we missing? Is God speaking in ways we don’t recognize? 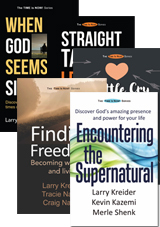 Larry and LaVerne Kreider help us examine these questions and many of the barriers that can block the voice of God in our lives. They also reveal their own struggle with God’s silences and the tremendous breakthroughs that can be discovered during life’s most confusing and darkest times. 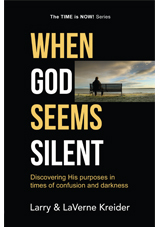 When God Seems Silent is the first book of a new series: The Time Is Now! This book will help you discover that The Time Is Now! to listen and find His purposes during the difficult seasons of your life. Prepare for breakthrough. Small group study Study in a small group setting or in a class or Bible study group.